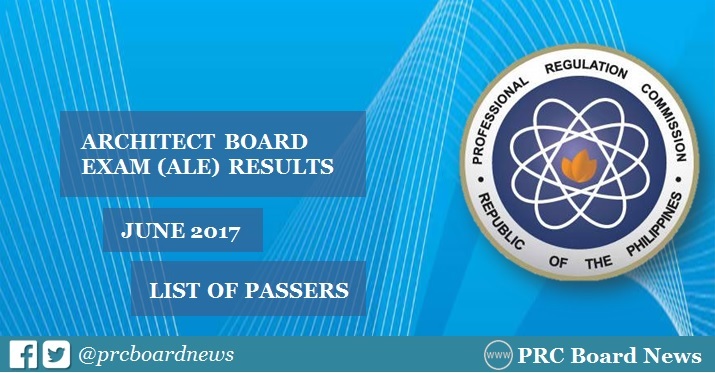 MANILA, Philippines - The Professional Regulation Commission (PRC) and the Board of Architecture (BoA) released official results of June 2017 Architect board exam or Architect Licensure Examination (ALE) on Wednesday, June 28, or in two (2) working days after the exam. The full list of passers, top 10 (topnocthers), top performing schools and performance of schools are available on this page as announced. UPDATE: 1,490 out of 2,679 (55.62%) passed the exams. PRC conducted the licensure exam in Manila, Baguio, Cebu, Davao and Legazpi on June 23 and 25, 2017. The recent Architect board exam covered the following subjects: history and theory of architecture, principle of planning and architecture practice, utilities systems, structural conceptualization, building materials and construction (June 23) and architectural design and site planning (June 25). PRC has set the target release date of Architect board exam result on Thursday, June 29, or in 3 working days after the tests. However, results may be released ahead of the target or on later date, without prior notice. PRC Board News will update this page immediately once the results are officially released online.